I’ve been looking forward to hearing Captain’s story since he was introduced to us in the previous books. He comes off cold and callous, but he does have a soft spot within himself. It’s buried deep down inside of him. He is hiding it from the world. Something happened to him that he doesn’t want everyone to know. But deep down I want to know his story. I want to know the real Captain. I want to know what makes him tick. What makes him the way he is? And I’m glad to finally have some answers. River “Captain” Kipiling had a past no child would like to remember. Having an absentee father a mother who was semi absent herself, Addy was the one girl who made him happy. The one girl who was home to him when then home he lived in was truly broken. The girl who he fully gave his heart to. When Addy died a piece of him died as well. He has avoided anyone who has reminded him of her to avoid the reminder of the past. Addy was the reason he changed his name and got a new identity. It is because of her, his world has changed and he became that cold person we all knew. The book is in present tense, but Captain gets flashbacks of his past. This is when we get parts of his story, growing up, what happens to him and how he gets involved with the mob. The flashbacks come in form of dreams, but to him they seem so real. It’s as if they happened yesterday, causing to throw Captain off kilter. His life was starting to become pretty normal till the past started to resurface. Trying to piece what could cause them to start, they only thing he can think of would be his server Rose, there’s some kind of familiarity with her but he can’t place his finger on it. Captain has one goal, start up the restaurant and move on. It helps that his head server Elle isn’t getting the hint that he doesn’t want her but to scratch an itch. She wants more, he doesn’t he never does. He gave his heart away a long time ago to one person, no one else will have it. There hasn’t been anything easy about Rose Henderson’s life from the moment she was born. She has gone through so much more than anyone can ever imagine and she has overcome every single one of them. Rose has proven that she is the strongest person out there to have endured everything thrown her way. But she does it all for one person, her sole purpose for surviving each and every single day. She has been searching for years for one person and now that she has found him, she doesn’t know how to tell him the truth or how he will react to it after all these years. He has proven that he the same man she has known him to be. That could be a game changer for her. Though Rose and Captain work together, she tries her best to avoid him, knowing she has a big secret she needs to keep from him. Something tying the both of them from the past. He still can’t place his finger on it. After doing some digging, Captain can’t believe what he is seeing. His past just came back full on. I definitely could not put this book down. I needed to know how this secret was going to unfold. I was pretty much at the edge of my seat the entire time. And boy I didn’t expect it to happen the way it did. I fell in love with Captain. I sure did. We’ve seen Captain kill people with no remorse for hurting people, now we see him in a different light, it’s pretty refreshing actually. I didn’t think he would be capable of love like this. But Rose, is hesitant to put herself out there again, especially where River is concerned. She’s seeing the old him again and that terrifies her to death. She’s afraid that it won’t last forever. I don’t blame her, but he’s certain to convince her. Rose has her insecurities, she shows it time and time again when women surround themselves around him. River will do everything in is power to make it work and keep them safe. But slowly she’s letting her guard down and they’re falling back into their old routine. Her heart after all belongs to him. It’s like nothing has changed between the two of them. But what happens when his past job comes rearing back? When that job isn’t done and he needs to finish it? When Captain needs to tell Rose the truth? Will she run and bolt from him? Or will she understand and stick by his side? Will this be a happy reunion? Will they be able to make it work and be like the good times? Can they be able to pick up from where they were and give their hearts back to each other? I loved this book completely! I finished it in one sitting. We get to see a different side of Captain and I definitely did swoon over him. I bet you will too. This is different than the other Rosemary Series books where we get a glimpse of the entire gang, we only get just a few of them in this one. Which didn’t bother me a much actually, it didn’t seem so overwhelming with everyone in it. Not everyone knows what Captain used to do in his previous job, but they’re slowly putting the pieces together and I love the fact that no one is asking questions or judging him about it. When Captain finds out who Rose truly is the old River comes out and we get a different man. A much more caring man. One who puts her before anyone one else. It’s like she’s put on a pedestal. And I love that about him. He worships the ground she walks on. Even after all these years, he remembers all the little things about her. His heart still truly belongs to her. I’m glad he got his happy. I really can’t wait for Nan’s book. If Captain can get his happy. I’m sure Nan can too. This was reviewed by Jenn. I received an advanced copy for my honest review. 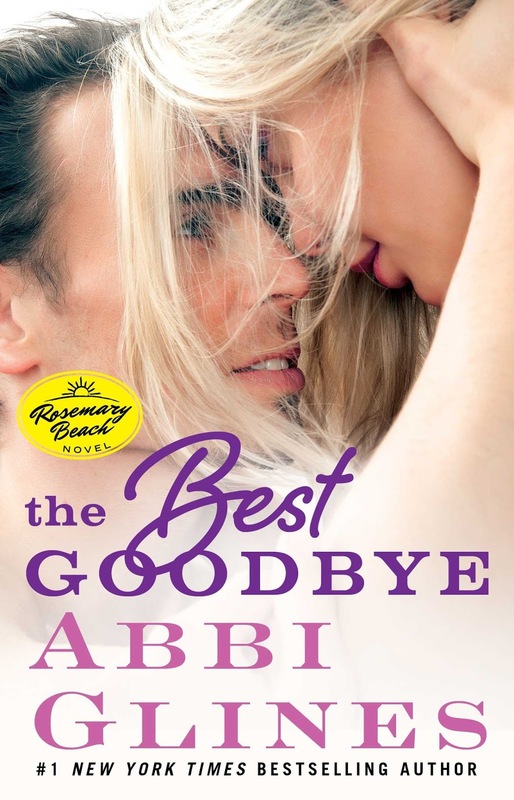 Use the rafflecopter for your chance to win one of five signed posters and print copies of THE BEST GOODBYE (US/Canada only). Contest begins on 11/30 and runs through 12/21. Good luck!